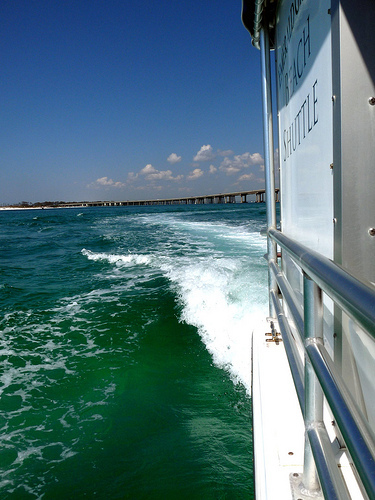 Better Than Never: Beach Vacation in Destin, Florida! 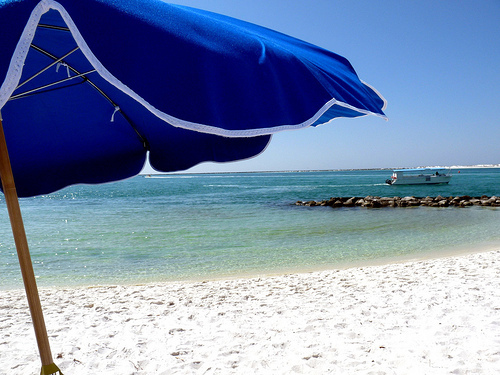 Beach Vacation in Destin, Florida! 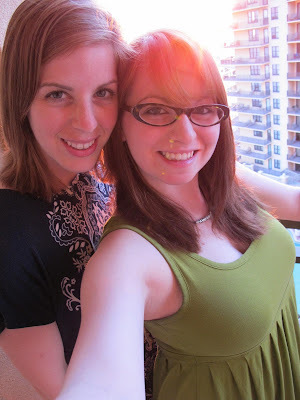 Over Spring Break, I was lucky enough to travel to Destin, Florida with my younger sister, Susan. We stayed at the Emerald Grande hotel and, because my sister works for a national magazine, a lot of our activities were comped. A pretty sweet deal, made all the sweeter by the beautiful beaches, friendly people, and luxurious afternoons we spent on the water! Here's a little photo tour of our vacation. Enjoy! 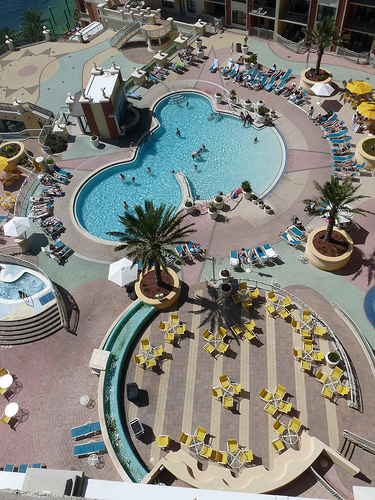 The Emerald Grande was a great hotel. Instead of a simple room, we actually stayed in a condo on the tenth floor. This baby had two balconies, three bedrooms, a full kitchen, and a living room with a large, flat screen television. We had breakfast on the balcony each morning while enjoying the beautiful view of the green water that stretched out around us. 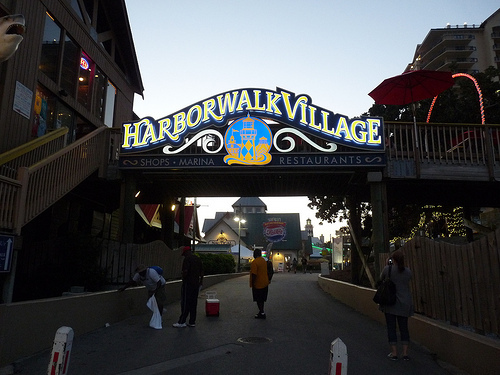 The hotel was positioned in the center of HarborWalk Village, which contained stores, restaurants and bars and provided all kinds of entertainment. While I am generally more of an adventurous traveler (I like going to out of the way places, exploring unfamiliar cities and being in the outdoors) I have to admit - having all your needs and desires within reach was quite a lovely novelty. 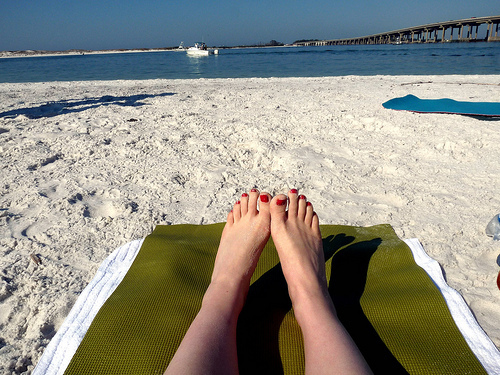 We did many things during our too-brief stay in Florida, but the top three highlights were definitely a yoga class on the beach; a sunset dolphin cruise; and a massage at the Emerald Grande's spa. 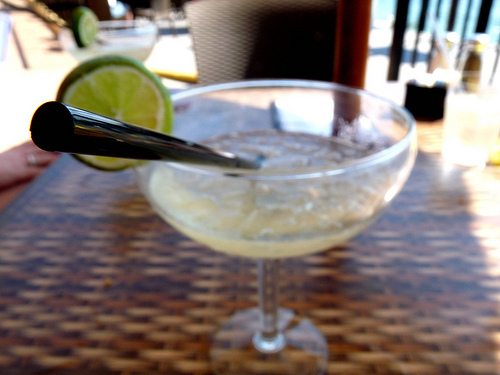 Coming in as close runners-up were organic margaritas at the Dancin' Iguana (tequila, agave nectar and lime - oh my!) and sunbathing and book reading on the beach. My legs are now a pinker shade of white, which is exciting. Yoga on the beach was awesome, if a little on the beginner side for me. But one of the beautiful things about yoga is that you can make every practice your own - poses can be modified to be easier or harder, and sometimes just holding the simplest pose for an extended period of time is harder than a fast moving flow class. Plus, everything is better in the sand and under the sun. I also LOVED the dolphin cruise. Our little ship took off at 5pm and motored around the gulf. We saw our first three dolphins very quickly - they were right off the side of the ship and swam under the helm while we watched and tried to snap photos. After following the three around for a bit, we went in another direction and came upon a group of dolphins leaping in and out of the water - there were at least nine of them, maybe more. (I just Googled the collective for dolphins and found that "pod" is most often used, with "school" and "pack" listed as alternatives. I love language!) 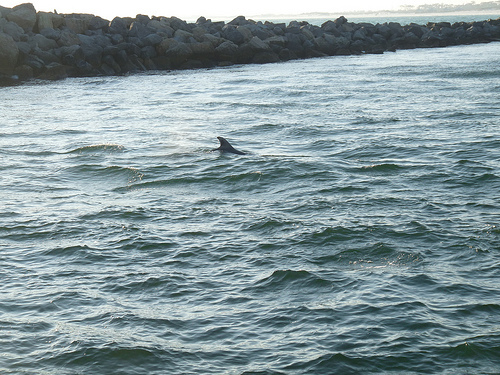 It was really hard to get a good photo of the pod of dolphins. They were quick, I am not and gazing at them in awe took precedence over getting the perfect shot. Instead, here is a sharky looking photo. I promise it's actually a dolphin. 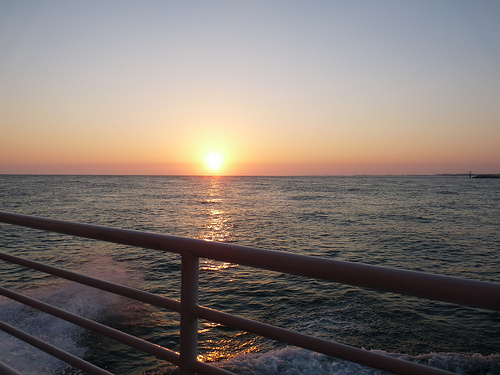 On our way back to shore, we stopped and watched as the sun went down over the horizon. It was pretty spectacular - definitely the most beautiful sunset I've ever seen. We also spent a lot of time eating and drinking which, if you followed my recent foray into foursquare, you've already read about. 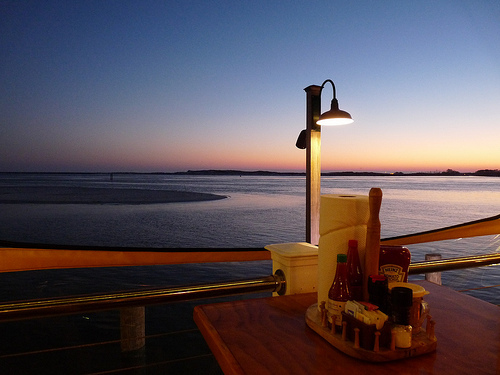 While I had some fine beverages, a lot of onion rings and my weight in guacamole, I have to say - vegetarian options were not very plentiful on the Emerald Coast. I did my best and I didn't starve, but I did realize something about myself. I have a delicate stomach. Fresh, wholesome vegan food makes me feel alive; just about everything else makes me feel sick and sluggish, even if it's tasty in the moment. I will remember this the next time I travel, and pack my snacks accordingly! All in all, it was an excellent trip, a much needed vacation and a great chance to spend some time with my middle sister, who I don't see nearly enough. The only thing missing was our third and youngest sister, Ally, but fear not - plans are already in the works for a true Sister Trip Oh Twelve. Until then!